This hum-cancelling pickup comes with a very complimentary tone-circuitry, allowing you to adjust EQ and control volume/slap, bass, mid-range and treble with the dedicated knobs. The SMB-4d and the STC-3M4 are a great match to experience amazing bass tone. The Seymour Duncan SMB-4d is a Hotter pickup, designed for the Music Man. It's recommended for classic rock, heavy rock, funk, punk, R&B, and metal. Expand the versatility of your tone with The STC-3M4 tone circuitry, which comes with all necessary mounting hardware: high-quality potentiometers on pre-wired harness; battery clip; stereo jack; and black anodised, knurled, dome-style knobs. Combine the two and you have the SMB-4DS. The SMB-4d boasts hum-canceling. Its tone contour is highly musical and balanced, whilst its bottom is richly articulated. There's lots of midrange and the treble has great bite. 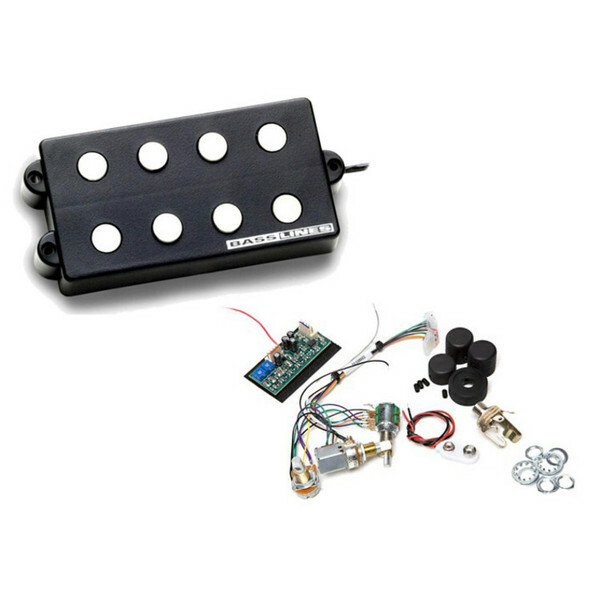 This pickup is designed as a replacement for 4-string Music Man® StingRay® basses from 1976 to present. The STC-3M3 electronics consist of on board Tone Circuits which add amazing tonal versatility. It allows you to subtract EQ at centre frequencies voiced specifically for the electric bass. These circuits boast low noise, low distortion and high headroom and are useful for all musical styles and genres. There are three bands of active EQ, plus the proprietary Slap Switch. The lows are deep, clear, and tight and the mids range from ultra-smooth to punchy and all points in between. With the treble control, you can get a very wide, very usable response that's smooth without any brittleness. By Pulling up on the volume knob, the proprietary Slap Switch is engaged; this is a special EQ contour specially for slap-style playing. This version consists of three knobs: volume/slap, mid-range, and stacked-concentric bass & treble. All to let you experiment and help customise your tone.